What Is An Ayurvedic Massage? This type of massage is designed to create balance among the mind, body, and spirit, and help the body heal itself. It’s sometimes referred to as an “oil massage” because it typically incorporates warm herb essential oils, as well as time-honored and non-traditional strokes and kneading that suit an individual’s needs. How Is Ayurvedic Massage Different From Other Kinds of Massage? In Ayurveda, the five elements that are found in all living things—space, air, fire, water, and earth—are considered the building blocks of life. These combine to create three mind-body principles, known as doshas, within the body: Vata (air and space), Pitta (fire and water), and Kapha (water and earth). Everyone inherits a unique mix of the three doshas, although one is usually more dominant. Ayurvedic practices balance of the doshas to govern one’s physical and emotional health. During an Ayurvedic massage, organic oil blends are infused with Ayurvedic herbs and heated to promote relaxation and detoxification. The oils are chosen to balance a person’s dominant dosha. At the right temperature, these oils enter the body through the skin and pores, bind to the ama (toxins), and are released to detoxify the body. In comparison, Swedish massage incorporates oil primarily to facilitate relaxing strokes on the skin. And Thai massage uses no oil, which is why people are able to leave their clothes on during this kind of massage. An Ayurvedic therapist focuses on clearing the energy channels in the body, moving and dislodging toxins, and balancing the chakras (energy centers). Thai massage also works with the energy centers of the body. With Swedish massage, however, the approach focuses more on core anatomy and physiology rather than body energy lines. The style and flow of an Ayurvedic massage are determined by what an individual needs. The massage therapist will typically use massage techniques including tapping, kneading, and squeezing, as well as traditional massage strokes. Movement flow can be quick or drawn out, depending on a person’s needs. The overall approach increases circulation and lymphatic drainage. Some spas provide two therapists working on one person simultaneously. Thai massage works with compression—in addition to pulling, stretching, and rocking—that’s directed into muscle tissues by either the hands or fingers. Thai massage usually takes place on a mat on the floor, and the person receiving the massage wears loose or stretchy clothing. The massage therapist is also on the mat and moves the person’s entire body into various stretches and positions. Swedish massage centers on relieving muscle tension through soft, long, kneading strokes, as well as light, rhythmic, tapping strokes, on the topmost layers of muscles. This is also combined with movement of the joints. What Are the Various Kinds of Ayurvedic Massage? One of the most traditional Ayurvedic treatments, abhyanga uses friction-based strokes and warm dosha-specific oils. As the oil is massaged into the skin, it penetrates the tissues to loosen toxins at a cellular level. This style of massage promotes circulation, boosts immune system function, and creates deep relaxation in the mind and body. Gandharva combines touch with sound therapy to improve energy flow. During this kind of massage, the therapist uses warm, herbal oils and crystal singing bowls to vibrate and transform the body’s cells. This treatment promotes vitality and blissfulness. Marma points are vital life or energy points among the body, mind, and emotions. During a marmamassage, dosha-specific essential oils are combined with a light, circular touch to stimulate these energy points. Marma massage awakens the body’s inner healing system, manipulates subtle energy or prana, relieves stiff muscles, and boosts circulation. This treatment includes five Ayurvedic techniques and is intended to work on the entire system—mental, physical, and energetic. It’s done by one or two massage therapists. It begins with Garshana, a dry-glove exfoliation that starts the detoxification process, stimulates the lymphatic system, and prepares the skin to absorb the oils. Then comes Abhyanga, in which the body is covered in warm herbalized oil from scalp to toes with friction strokes that move the oil into the tissues to loosen and dislodge ama (toxins). Next, the slow, deep, penetrating strokes of Vishesh promote relaxation. The treatment concludes with Marma (see description above) and chakra balancing, using dosha-specific essential oils. Pizichilli is typically performed by two massage therapists. It’s also sometimes referred to as an “oil bath,” as continuous warm streams of herbal oil are rhythmically smoothed into the body. This treatment warms, lubricates, and nourishes to enhance circulation, eliminate toxins, and purify the body. Shirodhara is a meditative and tranquil treatment centered on a soothing stream of warm oil that’s gently poured over the forehead and onto the third eye chakra, the energetic center of intuition that’s also known as ajna. This treatment is known to calm the central nervous system, and integrate the mind and body. After experiencing shirodhara, some say they feel a sense of restful awareness. Vishesh is another rhythmic massage technique. It uses firm, slow strokes to elongate contracted muscles, break up adhesions, and help release deep-seated impurities. Little oil is used. If it follows Abhyanga massage, much of the surface oil is removed. This allows for a higher level of friction on the skin and deeper access to the tissues. Following a Vishesh massage, some say they feel light, loose, and relaxed. What Kind of Ayurvedic Massage Is Best for Each Dosha? Imbalances are treated with their opposites in Ayurveda, therefore most Ayurvedic massages focus on countering a person’s predominant dosha. When Kapha types are in balance, they have sturdy builds, vigor, healthy digestion, and an overall sense of calm. Kaphas approach life’s stressors with ease and grace. Excess Kapha dosha, however, can result in lethargy, obesity, apathy, and depression. Digestion suffers, and allergies and respiratory problems may arise. As a result, Kaphas can become stubborn and resistant to change. Because of a lethargy tendency, Kaphas often benefit from deep-tissue, stimulating massage, such as Vishesh. 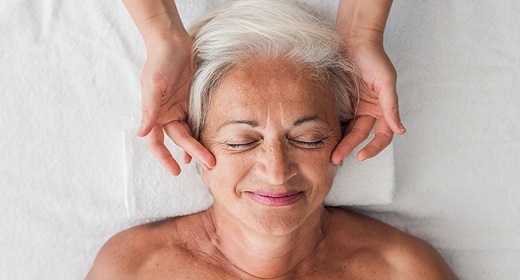 Read about other types of massages and treatments that help Kaphas. When in balance, Pittas tend to be joyful, friendly, and energetic. They tend to be of medium size and weight, and have strong digestion. The Pitta mind is clear and focused so long as it’s in balance. Out of balance, however, Pittas experience a lack of focus, increased stomach acid that can result in ulcers, constant thirst, irritability, temper outbursts, fever, and inflammation. Ayurvedic massages such as Abhyanga and Odyssey can help pacify Pittas by releasing toxins and calming their central nervous systems. Read about other types of massages and treatments that can pacify Pittas. Vatas tend to be always on the go, and have an energetic and creative mind. When Vatas are in balance, they will be lively and enthusiastic, with a thin frame and excellent agility. Energy comes in bursts and they are likely to experience sudden bouts of fatigue. When the Vata dosha becomes imbalanced, it manifests in the body as weight loss, constipation, hypertension, arthritis, weakness, restlessness, and digestive challenges. Shirodhara, Odyssey, and Marma help to balance Vata. Read about other types of massages and treatments that may sooth Vatas. If a person receives a massage that doesn’t suit their dosha, it can lead to greater imbalance both physically and emotionally. If you don’t know what your dosha is, take this dosha quiz to find out so you can ensure you explore a massage option that’s right for you. What Are the Benefits of Ayurvedic Massage? Ideally, massage is combined with other Ayurveda principles, such as diet and nutrition, and exercise, for maximum benefits. You don’t have to travel to India to get an Ayurvedic massage. There are plenty of spas in the United States that offer these specialized treatments. Just be sure to find a licensed massage therapist that is also trained specifically in Ayurvedic techniques. The Chopra Center’s spa in Carlsbad, California, specializes in Ayurvedic massage, and its Perfect Health program offers a different massage each day. You can also use aggregation sites, such as Spafinder, to find Ayurvedic spas and massage therapists across the country. If going to a spa isn’t your thing, you can give yourself an Abhyanga. A daily Abhyanga practice is known to restore the balance of the doshas, boost the immune system, and enhance overall well-being and longevity. Regular Abhyanga grounds and relaxes Vata dosha imbalances, but anyone can benefit from it. Read about the steps to follow for a self-massage practice. Should You Get or Self-Practice Ayurvedic Massage? In Ayurveda, it’s considered that there’s no greater expression of self-love than being anointed head to toe with warm oil—or by massaging oneself with oil. It can nourish the body, reinstate the balance of doshas, and improve one’s well-being and longevity. Because Ayurvedic massage is tailored to an individual’s wellness needs, it’s generally considered safe and beneficial when done by a qualified person. Or, if you’re going to try it on yourself, be sure to use a dosha-balancing oil for your needs and read the instructions for the self-Abhyanga before you get started.